U2 kicked off the fourth leg of their Vertigo tour in the Mexican city of Monterrey yesterday (Feb. 12). 48 hours before the concert, more than 600 fans were sleeping at the gates of the stadium in order to get into the ellipse; 24 hours before the show, there were more than 2,000 fans. 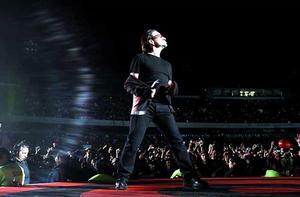 Mexicans have really missed the band, since the last time U2 visited Mexico was during the PopMart tour in 1997. The second show of the fourth leg of the tour will be at Mexico DF on February 15. Right now more than 200 people are queueing at the gates of the stadium. Two bad there aren’t any major changes to the setlist. And Vertigo twice? ehhh…. Hmm, keep in mind that the majority of people going to these vertigo shows aren’t seeing more than one show. It’s easy to sit back and complain about the setlists.. lol I remember waking up at 5am each morning to see what was being played in Europe and being a bit disappointed it was the same old. But for the people actually at the concert, most of whom aren’t seeing more than 1 show on the tour, and dont know what the usual setlists are like, each song is an awesome surprise. lordy… anyone want to bet that Bono did that “bull charge” with the fingers while Edge was playing guitar? The band did play Vertigo twice in some US shows as well. Specifically, Minneapolis – right after COBL and then as a surprise closer (40 was on the printed set list). And it was a good thing – kicked the crowds arses at the end. What a way to leave a venue on a Friday night..
Just a great night!! I was near when the staff took the Grammy into the scenary, but can’t take the pic. Posted some pics to your pool, Caroline. Vertigo twice was a great surprise at twickenham (London) and rocked! Before the internet there was no real way of finding out setlists so your first concert was always a surprise and most people were happy. THE MORALE: don’t look at setlists on the internet before your first show! I’ve stuck to this since Popmart and enjoyed the gigs much more.